MP4 is one of the main formats today to be played for videos. The rise of Apple TV is changing the situation, and it becomes all you need for the way you watch today. To enjoy amazing shows, live sports and news in MP4 going beyond anything you might have imagined, you can watch MP4 on Apple TV. Playing MP4 to Apple TV is important option for most users. Apple TV is a digital media player and micro-console developed and sold by Apple Inc. It is a small network appliance and entertainment device that can receive digital data from a number of sources and stream it to a capable television. To get full enjoyment on Apple TV, I’d like to share you something about video formats which the Apple TV plays. MPEG-4: up to 640 by 480, 30 fps, Simple Profile. H.264: 640 by 480, 30 fps, LC version of Baseline Profile; 320 by 240, 30 fps, Baseline profile up to Level 1.3; 1280 by 720, 24 fps, Progressive Main Profile. The videos purchased from iTunes store are supported. Generally speaking, Apple TV does support MP4 files. However, Apple TV only play MP4 files which are encoded with H.264 or MPEG-4 video codec as well as AAC audio codec. But MP4 is a multimedia video container format which may encoded with different video or audio codec. If your MP4 files is not encoded with MPEG-4 AAC or H.264 AAC, you will find that you can’t play MP4 on Apple TV. Apple TV is designed for you to easily navigate and, most important, fully enjoy these new world of videos. And to get more enjoyment, the video formats should be supported by Apple TV. If you want to watch MP4 on Apple TV, You should realize that to stream MP4 to Apple TV is in need. Since there is the professional software—Leawo video converter to convert MP4 to Apple TV, you can get useful tips and watch Apple TV with great appreciation. Leawo Video Converter is one of the fastest videos converters for MP4 to Apple TV. It is the best video file converter for you to convert videos and audios between all popular formats like AVI, MP4, MOV, MP3, AAC, FLAC, etc. This all-in-one video converter software offers powerful editing features to add special effects, watermarks, etc. With Leawo Video Converter, you can almost convert MP4 to Apple TV as quickly as possible and it is feasible for you get much more fun in converting and editing your MP4 video file if you apply all the technics of the Leawo video converting software skillfully. And there is user guide step by step in detail for Apple TV play MP4 so that you can easily get it. Step 1. Download and install Leawo Video Converter first. Step 2. Add your MP4 videos to the MP4 to Apple TV Converter. Click on the “Add Video” on the bar of the software, or directly drag MP4 videos which need to be played to Apple TV in MP4 to the program. Note: if there are several MP4 videos to be converted together, you can click “merge all files to one” (next to the green Convert button) and make all the separate videos into one. Open the drop-down box on the category bar and then click the “Change” button and go to the “Profile” panel, and you could select Device to get the playing devices, slide and choose Apple TV as targeted device. Back to the main interface and click on “Convert” button. On the popup sidebar, set a directory path to save the output video files. Then click the bottom “Convert” button to start converting the video from MP4 to Apple TV. And when 100% complete, you click “Finish” and you can play MP4 on Apple TV then. 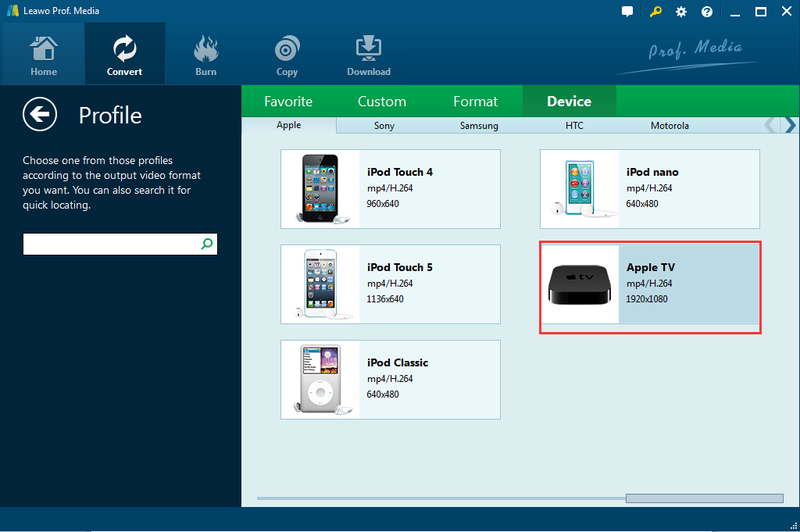 Except for Leawo Video Converter, there are also other online solutions for Apple TV play MP4. And Zamzar is one of the online converter which can be used to convert a variety of formats including MP4 to the Apple TV. And it is simple to operate. Step 4. The uploading process finished, “Your file has successfully finished uploading!” will come up, and the MP4 will be sent to the mail as soon as this is done and you can play MP4 on Apple TV then by downloading the file. It is widely known that when we try to add videos to Apple TV, we have to verify that the video format is compatible for use with Apple TV. According to their website, .mp4, .m4v and .mov are supported formats. However, sometimes we still encounter MP4 can’t be played by Apple TV issue. With online solution and converter software, you can stream MP4 to Apple TV as you like. Comparing to Leawo Video Converter, this online converter costs more time and you are not sure that exact time to get your Apple TV MP4 video, and it will not work when you have no internet. With the Leawo Video Converter, you easily get the tips on how to play MP4 on Apple TV. Anyway, there is no doubt that question like “can Apple TV play MP4″ will never perplex us at all. And it is our time to watch MP4 on Apple TV freely for appreciation.